InfoDesk PipelinePlus (available through InfoDesk PharmaIntelligence) allows you to retrieve records from multiple drug pipeline databases through a single search. This federated search system will return the corresponding drug profiles from each database, even if the query only matches a profile from one publisher. All of the results from your selected sources will be exported in a single file. Note that BizInt Smart Charts inserts a code at the top of each drug's list of Synonyms. This code starts "PipelinePlus ID", and indicates drug profiles which have been identified as the same by PipelinePlus. When you use the Generate Common Drug Names tool, this code will be used to ensure that the drugs matched by PipelinePlus will also be grouped together in BizInt Smart Charts. You must have BizInt Smart Charts for Drug Pipelines 4.1.1 (Jan 2016) or higher installed to create reports from Pipeline Plus. BizInt Smart Charts Drug Development Suite 4.1.1 can also be used. Earlier versions of BizInt Smart Charts do not have support for PipelinePlus. Note: If you don't see the BizInt Smart Charts option on the Report menu, contact InfoDesk to have the option enabled on your account. Perform your search and select the desired records. 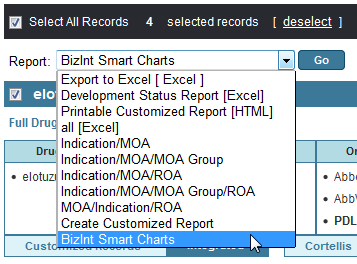 Open the drop-down list next to Report: and choose "BizInt Smart Charts". Press the "Go" button. Another window will open. Enter a title for the report, which will be used as part of the file name for the exported file. You can select either radio button -- there is no difference at this time. 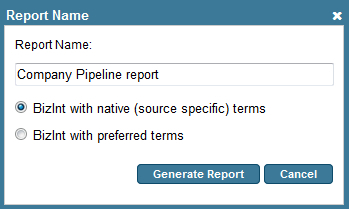 You may either wait for the report to download, or you can continue using the PipelinePlus system. The report will be available for download on the Reports tab in PipelinePlus. Simply click the "download" link next to the report you want to export. You may either save the report, or choose to open it. If you save the report, simply double-click the export file, or drag and drop into BizInt Smart Charts for Drug Pipelines (or the BizInt Smart Charts Drug Development Suite). As of version 4.1, the full records from Adis R&D Insight are not imported.